Election night was a good night for Asian and Pacific Americans — not only in Washington State but also nationwide. When the next session of Congress convenes in 2013, it will have more Asian and Pacific American members than ever before. Let’s take a look at the electeds-to-be who made it big last Tuesday, Nov. 6. Mazie Hirono, Senator elect from Hawaii, will be the first Buddhist senator, first female Asian American senator, and the first Japanese-born senator. She was born in Fukushima, Japan and immigrated to the territory of Hawaii with her mother in 1955 at the age of 8. Her mother raised Hirono as a Jodo Shu Buddhist. Hirono first ran for elected office in 1980, when she became a Representative in Hawaii’s House of Representatives. She continued on to Lieutenant Governor in 1994, losing the Governor’s race in 2002. Afterwards, she served in the U.S. House of Representatives from 2006 to 2012. As a U.S. Representative, she was the first Asian American Buddhist member, sharing the title of first Buddhist member with Hank Johnson of Georgia who was also elected in 2006. The person replacing Mazie Hirono is no slouch. 31-year-old Tulsi Gabbard is the first Hindu to win an election for Congress. She was also Hawaii’s youngest-ever elected when she became a legislator at the age of 21. She cut that term short, resigning her position to serve two tours in the Middle East as part of Hawaii’s National Guard. Though she is not of Indian heritage, her mother converted to Hinduism and raised Tulsi in the Vaishnava branch of Hinduism. Gabbard will be taking her oath of office over a Bhagavad Gita instead of a Bible. Ami Bera, a 47-year-old California Democrat, currently holds an approximate 2,000 vote lead over incumbent Dan Lungren in the contest to represent California’s 7th District in the U.S. congress. If he wins, he will be the first Indian-American Hindu and only the third Indian-American to be ever elected to Congress. Mark Takano, the Harvard-educated Democrat who will be representing California’s new 41st district, will be the first openly gay, non-white Congressman. He was born in Riverside, Calif. but his family was interned during World War II. This was his third time running for Congress, having lost the first two elections by very slim margins. 71-year-old Democrat Mike Honda won his bid for reelection to represent California’s 17th District. Honda, who was interned as a child during World War II, is soon expected to represent the only district outside of Hawaii to be made up of a majority of Asians. Tammy Duckworth, 44-year-old Democrat, lost both her legs and the use of one of her arms when the helicopter she was piloting in Iraq was hit by a rocket-propelled grenade. Despite this, she beat out a Republican incumbent and will be the first Thai-Chinese American woman in Congress as well as the first injured-in-combat female veteran in Congress. The race for the seat was marred by vicious attack ads and accusations that Duckworth relied too much on her military service during the election. Grace Meng will become the first Asian American to represent New York in Congress, despite the Chinese’s long history in the state. Meng represents the predominately Chinese neighborhood of Flushing, located in the borough of Queens in New York City. Colleen Hanabusa, one of the three female Asian Americans elected to Congress from Hawaii, successfully defended her position, defeating her opponent Charles Djou 54 percent to 44. She was first elected to the House of Representatives in 2010. When serving in the State Senate of Hawaii, she was the first woman president of the Senate in 2006, making her the first Asian American woman to preside of a state legislature in the United States. But, despite the gains made this year, Asian and Pacific Americans are still underrepresented in Congress. Of the 541 members of Congress, only 11 — or two percent — are Asian American. The U.S. population is currently 4.5 percent Asian American. But progress is being made and Asian Americans are becoming more involved. “Today is a first for Congress,” said Mike Honda (D-Calif.), in an interview with Rafu Shimpo, a Los Angeles-based Japanese newspaper. “The next Congress will see more Asian American and Pacific Islander members of Congress than ever before. 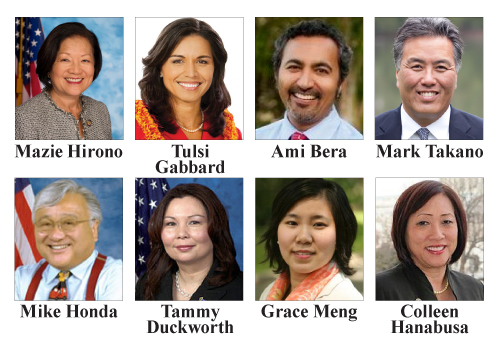 As chair emeritus of the Congressional Asian Pacific American Caucus, this is everything I’ve worked to create and I’m thrilled to see Congress more diverse than the day I started. That goes for the more Hispanic American 113th Congress, the first openly gay senator in history, and the first Asian American woman in the Senate too. Congress is slowly, but surely, starting to better represent America.